As part of the “Rethinking Yemen’s Economy” initiative, more than 20 of the leading socioeconomic experts on Yemen converged for the second Development Champions Forum on January 14-16 in Amman, Jordan. Among the urgent topics of discussion was the deterioration of the value of the Yemeni rial (YR), the magnifying impact this is having on the humanitarian crisis, and the need to re-empower the Central Bank of Yemen (CBY) as the steward of the rial and the economy generally. 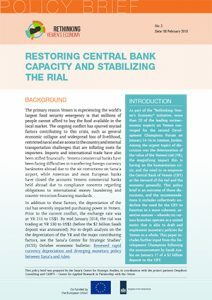 This policy brief is an outcome of those discussions, and the recommendations it includes collectively underline the need for the CBY to function in a more coherent, assertive manner – whereby its various branches operate as a united entity that is able to draft and implement monetary policies for Yemen as a whole. This paper includes further input from the Development Champions following the announcement by Saudi Arabia on January 17 of a $2 billion deposit to the CBY. The primary reason Yemen is experiencing the world’s largest food security emergency is that millions of people cannot afford to buy the food available in the local market. The ongoing conflict has spurred myriad factors contributing to this crisis, such as general economic collapse and widespread loss of livelihood, restricted naval and air access to the country and internal transportation challenges that are inflating costs for importers. Imports and international trade have also been stifled financially: Yemeni commercial banks have been facing difficulties in transferring foreign currency banknotes abroad due to the air restrictions on Sana’a airport, while American and most European banks have closed the accounts Yemeni commercial banks held abroad due to compliance concerns regarding obligations to international money laundering and counter-terrorism financing standards. In addition to these factors, the depreciation of the rial has severely impacted purchasing power in Yemen. Prior to the current conflict, the exchange rate was at YR 215 to US$1. By mid January 2018, the rial was trading at YR 530 to US$1 (before the $2 billion Saudi deposit was announced). For in-depth analysis on the the depreciation of the YR and the major contributing factors, see the Sana’a Center for Strategic Studies’ (SCSS) October economic bulletin: Renewed rapid currency depreciation and diverging monetary policy between Sana’a and Aden. Carry out the CBY’s full legal mandate, in accordance with Law 14 of 2000 and the amendments of 2003. This includes managing any and all Government of Yemen foreign currency accounts. Regulate domestic currency printing and monitor distribution so as to ensure the optimal balance between easing the cash liquidity crisis and creating further downward pressure on the rial’s value. The guiding metric in this equation should be per capita purchasing power relative to basic commodities, which the CBY should seek to maximize. Establish specific coordination mechanisms with Yemeni banks, money exchangers and large private sector actors regarding currency stabilization. The primary immediate need for such coordination relates to the CBY’s deployment of the $2 billion deposit announced by Saudi Arabia; coordination between the CBY, banks, money exchangers and private sector actors should seek to magnify the stabilizing impact of these foreign currency reserves and their ability to facilitate basic commodity imports, while simultaneously minimizing the rate at which the CBY expends these reserves. Enact monetary policies, legal procedures and coordination mechanisms with Yemeni banks and large private sector actors to curb the ability of currency exchanges and speculators in carrying out coordinated currency market manipulation. Identified violators of the set policies and procedures should face legal action, including the possible imposition of sanctions. Begin providing commercial banks with the interest due on treasury bills in order to boost market liquidity and to encourage banks to pay interest on their customer deposits. Given the large proportion of Yemeni bank assets held in treasury bills, interest paid on these would inject significant liquidity into the banking sector, in turn empowering banks to regain customer trust. CBY leadership must relocate permanently to Yemen. Current circumstances in Yemen represent a challenging operating environment; however, CBY leadership operating from abroad – as is currently the case with senior management largely based in Amman and Riyadh – is insufficient for effective central bank management. A properly functioning central bank is not possible without the physical presence of CBY leadership on location in Aden. Draft and circulate monthly, quarterly and annual reports amongst domestic, regional and international stakeholders that include the balance sheets of banks operating in Yemen and data that maps the level of liquidity in the local market in order to enhance transparency. Although the new FIU will be located in Aden, it should seek ways to carry out its responsibilities throughout the country, including Sana’a, to maximize effectiveness. The FIU should resume its regular meetings and coordination with the Middle East & North Africa Financial Action Task Force (MENAFATF), among other organizations, to ensure that Yemeni bank processes and practices are in compliance with international standards. Yemeni banks were largely forced to close their accounts abroad because of the compliance risk these posed for foreign banks. Reactivating the FIU would be a positive step toward reducing that compliance risk and allowing Yemeni banks to reopen accounts abroad. Refrain from holding foreign currency accounts outside of the CBY, as per Yemeni law. (Currently the GoY holds an account at Ahli Bank in Saudi Arabia, where revenues from oil exports have been deposited until recently). Improve government revenue collection mechanisms – such as those related to taxes, customs duties, and oil and gas revenues – and ensure that these funds are deposited in government-held accounts at the CBY. Effective anti-corruption measures should also be considered among the primary means to improve government revenue collection. Draft and circulate private monthly, quarterly and annual economic reports amongst domestic, regional and international stakeholders to enhance transparency. In particular, this should include data concerning government revenues and expenditure. The national budget should also be shared with the Yemeni Parliament when it reconvenes. Refrain from covering governmental expenditures through inflationary means, such as printing domestic currency in the absence of economic expansion. Cancel previous instructions that insisted on the collection of state revenues in cash, which pulled cash from local banks and reduced liquidity. Instead, enforce the use of cheques in the collection of state revenues. The use of cash in state revenue collection also leads to heightened levels of government corruption and increases the risks of doing business, given the highly insecure environment. Re-activate the National Committee to Combat Money Laundering and Terrorism Financing. The operations of this committee have been suspended since the onset of the conflict. Reactivating this committee would be a positive step toward reducing Yemen’s compliance risk. Form an advisory team to assist the government with fiscal and economic policies, in coordination with the CBY. The advisory team should consist of representatives from state institutions, prominent economists and representatives from all major sectors of the economy. This team can also act as an advisory council on Yemeni socioeconomic affairs for the GoY, and regional and international stakeholders. Given the significance of natural resource revenues for Yemen’s GDP and government expenditure, the GoY must look to increase oil and gas production and exports in view of reaching pre-conflict levels. Engage actively with the Saudi government to explore options for waiving or at least reducing taxes/fees that the Yemeni diaspora are obligated to pay in Saudi Arabia, thus enabling the Yemeni diaspora to send additional remittances to Yemen. Mobilise additional foreign currency deposits from GCC countries to support the CBY in stabilizing the YR, facilitating imports of basic commodities and facilitating the resumption of basic public service delivery. Assist Yemeni banks in providing trade finance facilities to Yemeni importers purchasing basic commodities abroad. Allow the resumption of flights to transfer Yemeni commercial banks’ foreign currency banknotes to their accounts in Manama, Bahrain. Accelerate the establishment of the Trade Finance Facility for Food Imports that the World Bank Group announced in April 2017. Provide technical support and capacity-building assistance to the CBY to allow it to fulfil its mandate as a central bank. This capacity building and technical support should include training, consultancy teams and/or advisers to help improve internal processes and systems. For example, the installation and use of modern IT systems would help the CBY manage the national budget, international transactions and other central bank duties. The coalition members that control access to Yemen’s Red Sea ports should not grant oil importation clearances unless the importer submits all the appropriate documentation regarding the mechanism of payment for the shipment (for example, documentary credit, commercial transfer, etc). This will serve two purposes: it will help rein in the leverage money exchangers exert over the currency market and help deter illicit oil shipments. For details please see: CBY, “Law No. 14 of 2000 on the Central Bank of Yemen”, available at: http://www.centralbank.gov.ye/App_Upload/law14.pdf (accessed February 3, 2018).